It’s that time of year! Time to start planning for school auctions. 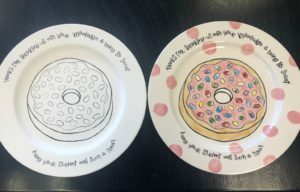 #Fingerprintpottery is a great way to net your school a lot of money. 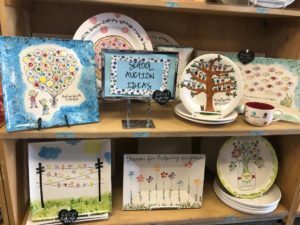 Parents love anything their kids create, and bright, hand-painted pottery can help fund important programs. Let us show you how it works at #ClayCafeStudios. 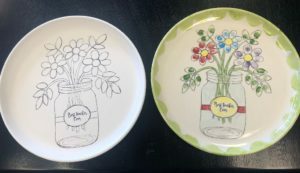 We have plates and platters with pre-drawn designs just waiting for you. So easy! We will loan you several colors of paint to take to your school to have the kids fingerprint the pottery. Once you bring the pottery back to our studio, we are happy to do the finishing details, including any writing you would like. We will glaze and fire it in our kiln. You pottery will be ready for pick-up in one week. Give us a call or come by #ClayCafeStudios anytime and we will help you make plans to make your school top dollar this year!